In past posts, I’ve introduced master baker Mohammad Tahmili (or the “cookie nazi”), the man whose shop, Tabrizi Bakery, I visit in advance of each Nowruz to pick up holiday essentials, chief among them, his otherworldly cookies. I’ve mentioned that of his impressive roster of goodies—the flaky and subtly sweet zaban and nazook; the chewy almond and walnut macaroons; the thin, raisin-studded, sometimes saffron-dyed nan-e keshemeshi; the rosewater-scented, rice flour–based nan-e berenji; the sticky-nutty, floral Persian baklava (baghlava); the fried and syrup-dipped bamieh (named after their visual likeness to okra) and zoolbia; and the fruit-filled danmarki (or danish)—my favorite is the humble chickpea cookie, nan-e nokhodchi. 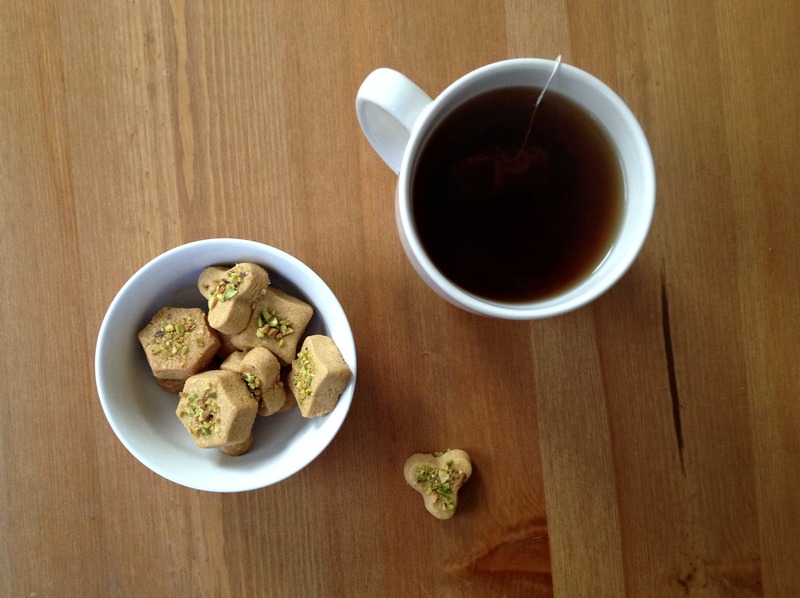 These chickpea cookies, which are punched out with miniature four-leaf clover cutters, are unlike anything I can think of in Western baking but, if a comparison must be made, they’re probably most similar to meltaway cookies or shortbread. Made with chickpea flour and no wheat flour, they’re a bit dry and fine-and-powdery-crumbed (surprisingly, in a good way) and super tender, with a melt-in-your-mouth texture. They’re at once light and hearty. Far from vegetal-tasting, they have a flavor that reminds me of deeply toasted nuts, and their taste is heightened by aromatic vanilla and cardamom. I haven’t needed to bake these cookies myself, as Mohammad does them better than I ever could, mostly because the dough, if you can call it that, in traditional recipes is a bear to work with. When the flour (gluten-free, structure-building-free chickpea flour) and the fat (vegetable oil, which remains fluid when chilled, or ghee, which remains soft when chilled) meet, a dough that is easily rolled and cut by anyone other than a skilled Iranian baker is surely not made. It’s crumbly. It cracks. It breaks your heart. And that chickpea flour? 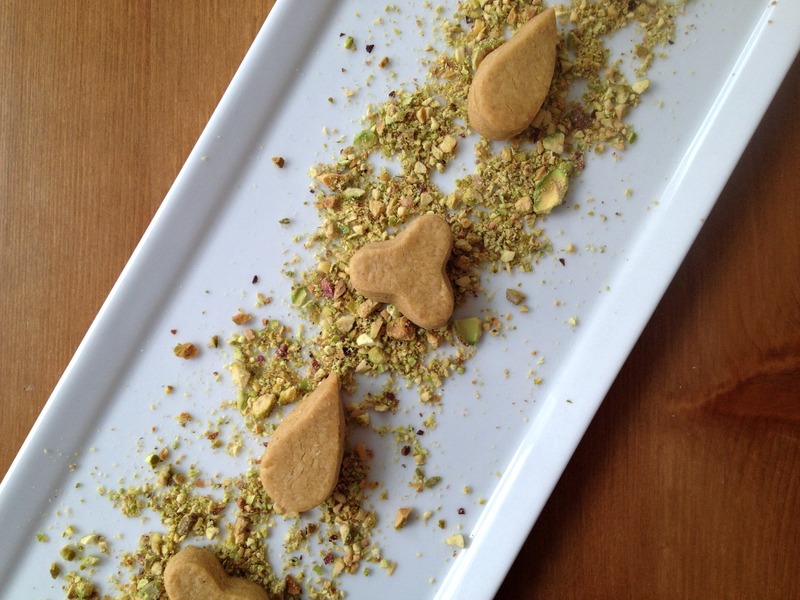 In Iran it comes triple-sifted (contributing to the cookie’s fine texture) and roasted (contributing to the cookie’s nutty flavor). 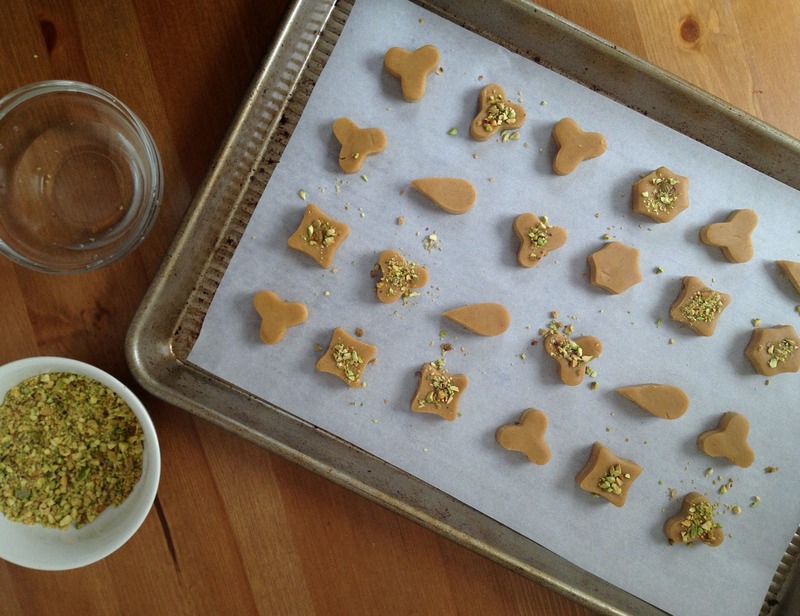 But after tackling that stretchy ice cream last year, I wanted to work out a more practical recipe that sheds light on the world of Persian sweets, and I wanted to enjoy something—even something this small—to help mark this special occasion. Some recipes get around the aforementioned challenges of this cookie by calling for adding some all-purpose flour to help create elasticity and cohesiveness or an egg to bind the dough. But I don’t do those things here. Greedy me wanted a cookie of 100% flavorful chickpea flour, with no egg to create a heavier, more cakey texture. Luckily, US-sold chickpea flour can be toasted easily in a large skillet on the stove and manually triple-sifted. The traditional choice for the sugar is confectioners’, and I employ it here; it contains cornstarch and is perfectly fine and quick-melting, helping decrease sandiness and increase the dissolving nature of the cookie. I substitute more flavorful butter for the oil because it’s solid when chilled; that means that refrigerating the dough makes it more workable—workable enough to roll and flatten to the correct thickness and to cut with teeny cutters. The milk fat takes away just slightly from that trademark meltaway aspect of the cookie, but the workability and the flavor dividends more than make up for that very minuscule difference. A relatively low baking temperature maintains the tender texture. All of these tricks result in a one-bite cookie that’s great with tea and that’s dangerously popable. Eight-in-one-sitting popable. These cookies may seem foreign—like, at this point, the very concept of spring itself. But I hope that one sunny day, something similar will grace the American cookie plate, next to the chocolate chip and the oatmeal-raisin. After chilling the dough round, do not flatten or roll until it is warm enough to be workable. You want to work with chilled dough, but dough that is too cold will crack and crumble. You need not worry too too much about overworking this dough; it is relatively starchy but it is gluten-free. Once you make the dough, you will understand how it feels and how you should move with it. You can use a 1-inch cutter for the cookies if you’d prefer. It’s very intuitive. Do not use a firm finger when pressing pistachios into cookie dough or the cookies will crack when they’re baked. To check the color of the bottom of a cookie, gently knock over the cookie with a small offset spatula. Handling the cookie before it is fully cool will cause it to break. 1. Place flour in large skillet and toast, stirring constantly with wooden spoon, over medium heat until flour smells like popped popcorn and is light golden in color (be careful not to burn). Transfer flour to bowl and let cool completely. 2. Sift chickpea flour 3 times. On the third time, sift with cardamom and salt. 3. Using stand mixer fitted with paddle, beat butter on medium speed until smooth and creamy, about 1 minute. Add sugar, increase speed to medium-high, and beat until light, about 2 minutes. Mix in vanilla. 4. Reduce mixer speed to low and slowly pour in flour mixture. Mix until all flour is moistened and clumpy dough begin to form. Dump cookie dough on work station and knead with heel of you hand until dough comes together and is uniform. Shape into smooth, even 6-inch disk. Wrap tightly in plastic wrap and refrigerate dough for at least 2 hours or up to 12 hours. 5. Adjust oven rack to middle position and heat oven to 300 degrees. Line baking sheet with parchment paper. Let dough sit at room temperature until workable, about 15 minutes. (If dough is refrigerated for more than 2 hours, you may need to let it sit out anywhere from 30 minutes to 45 minutes to soften to the correct texture.) Using your palms, flatten dough evenly, then slowly and carefully roll (or, rather, push outward) with rolling pin until it is ½ inch thick. Using roughly 3⁄4-inch cookie cutters, cut out shapes, placing cutter very close to where last cookie was cut out. 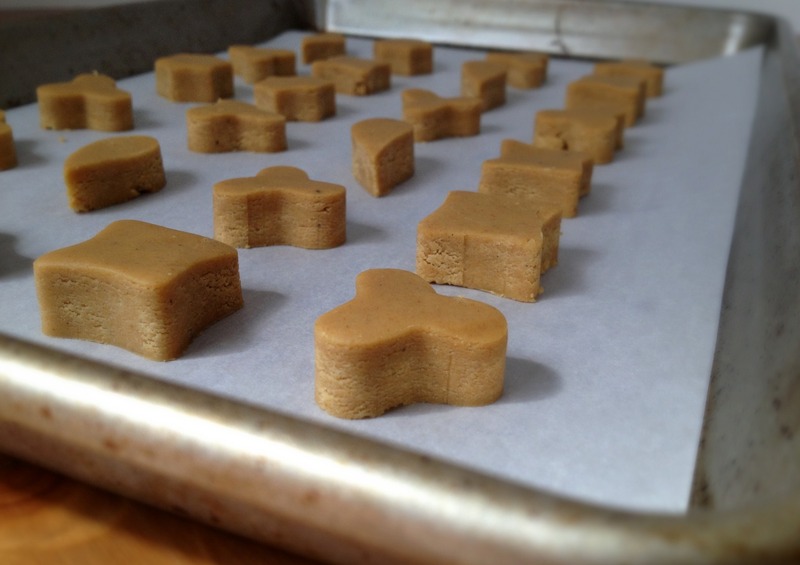 Use your pinkie finger to carefully push dough out of cutters and onto baking sheet, spacing cookies evenly. Reroll scraps until dough is gone. 6. If using pistachios, lightly dip pinkie finger into bowl of water and lightly brush top of cookie and top with pinch of ground pistachios, pressing larger bits very lightly into cookie. Bake cookies until bottoms and sides are golden, 18-23 minutes, rotating sheet halfway through baking. Transfer sheet to wire rack and let cookies cook completely on sheet before serving. Hooray for spring. And for chickpea cookies. These look divine. Before I moved to Boston (10 years ago!) I always associated chickpeas with dessert and sweets, because that’s how it was commonly eaten in the Philippines. So nice to see a cookie made with chickpea flour! I bet I would love these! I didn’t know that, Bianca! What are some Filipino chickpea-based desserts? I think you would like these. 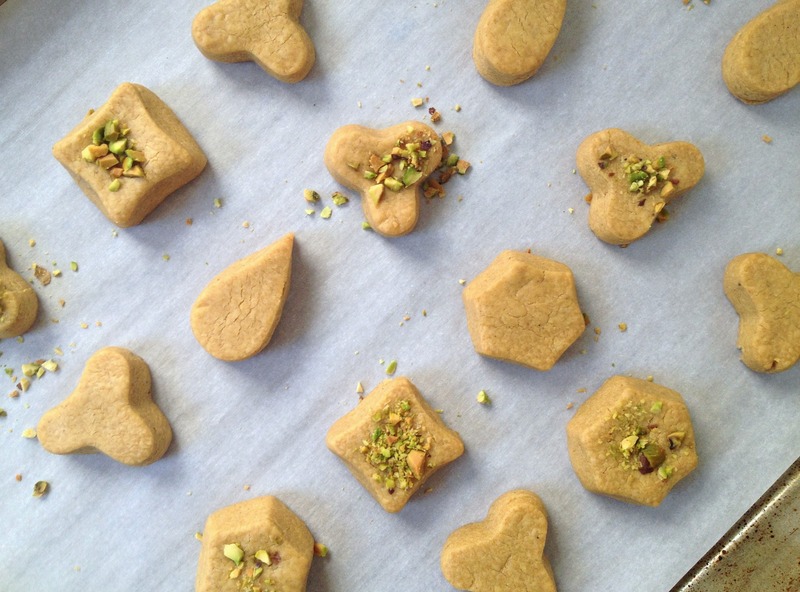 Happy New Year to you, those cookies look amazing and I have a friend who adores the challenge of recipes like this and am just about to send her a link – I might try too as your passion for them has really got me interested, never made anything sweet with chickpeas so can’t wait to try! Thanks, Joanna. Let me know if either of you make the recipe! You always have the most interesting things here. And, also as always, beautifully written. Bring on spring! Thanks, Michelle. You’re too kind. these sound pretty amazing! especially with the unique ingredients- chickpea flour would get me every time! I love chickpea flour. It’s more versatile than a lot of people may think.